On this date in 1481, two Lithuanian princes were beheaded in Vilnius for plotting the assassination of the Polish-Lithuanian king. This late 15th century was a heady time for Poland under the Jagiellon dynasty, and one of this dynasty’s going projects was keeping the adjacent realms of Poland and Lithuania linked together. In time, they would become formally joined, but at this point they were independent entities “united” only by the personal union of the Jagiellon monarch himself. That monarch in the late 15th century was the redoubtable Casimir IV (Kazimierz IV): Grand Duke of Lithuania since 1440, King of Poland since 1447. Casimir’s family hailed from Lithuania; indeed, as that place had been last European place to Christianize, Casimir’s own father had been born a pagan. 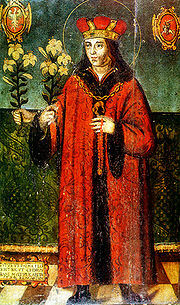 Casimir IV’s eponymous son is St. Casimir, patron saint of both Lithuania and Poland; both actively honor his feast date of March 4. Lithuania had a strong independent streak (pdf), and its boyars did not necessarily see eye to eye with the Grand Duke. Casimir was keen on centralizing Lithuania’s administration and checking the potential rivalry of the most powerful Lithuanian families, the classic seeds of crown-vs-nobility conflict the world over. And both watched with a wary eye the growth of Muscovy under the energetic leadership of Ivan III, aka Ivan the Great. That expanding state in the 1470s gobbled up the buffer city-state of Novgorod; Ivan III’s newly-minted honorific Tsar of all the Rus(sians) openly announced his designs on Lithuania’s own historically Slavic Ruthenian territory. “The gatherer of the Russian lands,” Ivan is known as … and Lithuania (much larger then than it is now) stood to be the gatheree. Come 1480, Casimir was allied against Moscow with the Mongol Horde, the famous “Tatar yoke” that had been collecting Russian tribute for two-plus centuries. In Russian historiography this is the crucial moment when that yoke is thrown off, and the Muscovites accomplished that in part by crossing up the Lithuanians. The Horde, having marched through Lithuanian territory, assembled on the banks of the Ugra River, opposite a waiting Muscovite army. Neither army attacked. Instead, they waited … and waited … and waited some more. The Horde, for its part, was waiting for reinforcements from its Lithuanian ally. But those reinforcements never arrived, thanks in part to Russia’s alliance with Crimean khan Mengli Giray, who seems to have absorbed Casimir’s attention in the fall of 1480 with a vexing combination of raids into southern Lithuania and dilatory ceasefire diplomacy. Distracted by the homeland threat, Lithuania never got around to supporting the Horde … and the Horde, after freezing itself on the banks of the Ugra for a couple of months, simply marched away in frustration. Moscow never again paid it tribute … and its Crimean ally destroyed the Great Horde utterly in 1502. And these nobles were getting it at both ends, since Casimir’s state-centralization project meant that they were being cut down to size in terms of their internal political power, too. Apparently with the support of Moscow itself (whose expansionary interest is self-evident) Iwan Holszanski and Fedor Bielski hatched a plan to murder the Grand Duke and his sons on Palm Sunday, 1481 — which was also the occasion of Fedor Bielski’s wedding. The idea was to replace him with Michal Olelkowicz (Mikhail Olelkevich), who had been Novgorod’s elected prince-ruler in the late 1460s; it’s not clear to me if Olelkowicz himself was actually in on the scheme. Casimir, at any rate, caught wind of the plot. Legend has it that a servant decorating a room ran across the conspirators’ weapons niches and reported it; it’s alternately alleged that the assassins meant to jump Casimir while out on his favorite pastime, hunting. However it was supposed to go down, it didn’t work. Bielski was able to flee to Moscow (ditching his newlywed bride), but left Holszanski and the coup’s prospective beneficiary Olelkowicz to suffer beheading this date upon evidence “brighter than the sun” of their treason. The Polish-Lithuanian State 1386-1795, by Daniel Stone. Russia’s Steppe Frontier: The Making of a Colonial Empire, 1500-1800, by Michael Khodarkovsky.